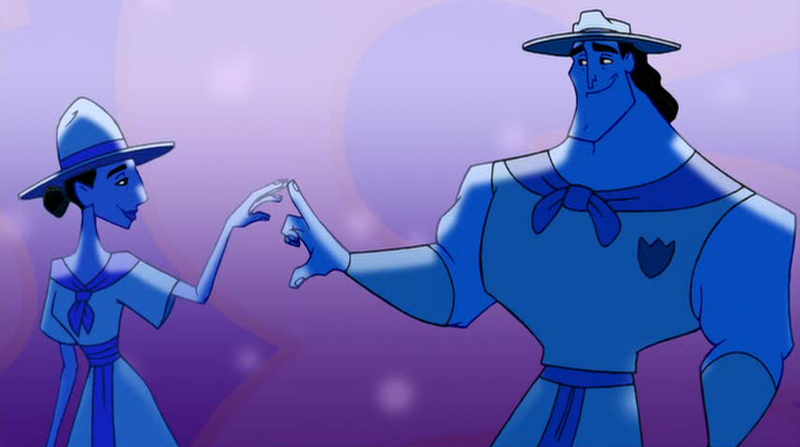 By December of 2005, Disney sequels had been around so long that there was really nothing left for them to do that could possibly shock anybody who'd been paying the least attention to the rampant consumer-baiting that the company had turned into a bottomless ATM, and yet I'm still a little surprised that Kronk's New Groove exists. The thirty-ish sequels made by Disney Television Animation, and its Orwellian-named successor, DisneyToon Studios, fall into a handful of different camps, and in every case it's pretty easy to see how all of these made sense from a financial standpoint: sequels to movies from the beloved Disney Renaissance of 1989-'99; new additions to the longstanding Winnie the Pooh merchandising empire; sequels to classic Disney movies about talking animals; and that one random sequel to Cinderella, which at least makes sense on the grounds that Cinderella has always been sort of the ambassador of the Disney Princess line. The odd men out are the Lilo & Stitch sequels, but that film was the one outright box office success made by Walt Disney Feature Animation in the first half of the 2000s, and Stitch himself is such a remarkably marketable figure that it's really not surprising in the least that Disney would want more of him out there. And, of course, Atlantis: Milo's Return, a feeble accident of history that saw the light of day only because it was pretty much impossible for Disney to lose more money on that project by finishing it and releasing it than by burying it (the ol' Belle's Magical World approach). And then there's Kronk. I have no idea at all, what aspect of The Emperor's New Groove led Disney to decide that it had earned a sequel; surely not its hugely underwhelming box office, nor the small, admiring cult of college-age viewers who endeavored to redeem the film's reputation. Despite an episodic structure, it's distinctly not a cobbled-together anthology from the ruins of a failed TV show. The only explanation I have, really, is that DisneyToon's success had made the company power-drunk, and they were pursuing new sequel ideas solely in the spirit of "that's a brand name! we can exploit it!" Without pausing to think if it was actually a well-known brand name, but thankfully that kind of moronically insular thinking is no longer part of Disney's corporate culture. We'll have more opportunity to discuss Disney's attempts to throw sequels where they don't belong in the future, I regret to say; for now, let's just stick with the one single movie in front of us. At least the company did one sane thing: they didn't really make the sequel a sequel, but a spin-off starring the first film's obvious breakaway popular side character, Kronk (Patrick Warburton), the dumb beefcake henchman of the villainous sorceress-vizier Yzma (Eartha Kitt, doing a poor Eartha Kitt impression). Sane, I say, and not successful: Kronk's New Groove proves more than anything else that just because a character is delighting in small doses, that doesn't mean that he's even tolerable as a giant main course, as if that regrettable truism even needed the proving. Though it's not simply that there's more of Kronk this time around, but that the Kronk we get here is not entirely recognisable. 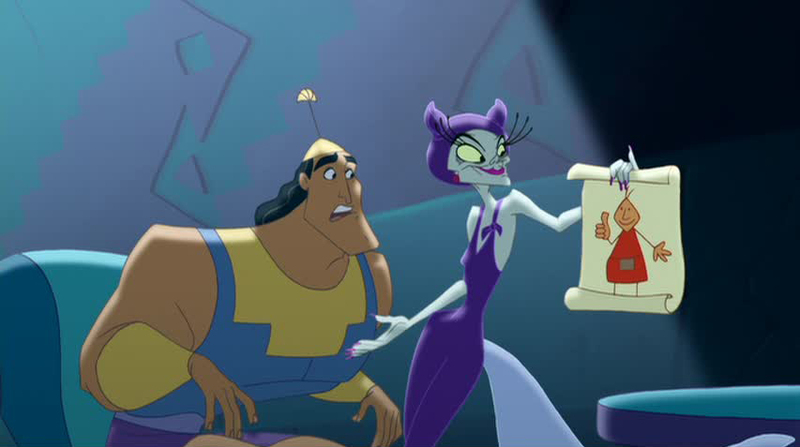 It wasn't just the character who was so funny in the first film, but the context: the interplay between him and Yzma, which isn't even replicated in the brief span of the sequel where she appears, given that Kronk has cleanly graduated from unthreatening bad guy to hero (his shoulder angel and shoulder devil from the first movie reappear several times, mostly to underscore that he's never even a little bit in danger of siding with the devil). And that, too, is less funny: a big dumb thug with just enough moral backbone to wonder aloud what he's doing is an interesting character around whom entertaining jokes can be built. 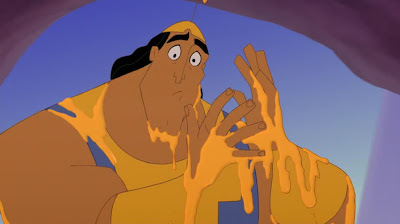 Kronk is now less dumb and he's not a thug at all: he's a bumbling CBS sitcom character who'll keep trying to get things right, and durn it, he's bound to succeed one of these days. Thinking about that too long is going to make my eyes glaze over. Part of the great joy, to me, of The Emperor's New Groove was its rare-for-Disney embrace of full-on cartoon anarchy, a thoroughgoing renunciation of dramatic stakes or moral weight in favor of the constant question, "what can we do right now that will be both ridiculous and funny?" For its sequel to abandon that dizziness in favor of bland stock situations is a betrayal of source material that offends me, though at least Kronk's New Groove basically works as a story in its own right, and this is not always a thing we can claim of DisneyToon productions. It's even funny at points, and this is a thing we can claim even less. The movie has it that, a good year or two after the first movie, Kronk has settled in as the cook at the little restaurant featured in one scene there, and the more that we try to parse out the continuity between the two films, the more it will scatter away like a little bird, so I'm just going to say that the first movie emphatically doesn't present that restaurant as existing within sight of the village where sensible peasant Pacha (John Goodman) lives, or where Emperor Kuzco (David Spade) apparently didn't end up building his summer cottage. I won't bring any of this up again. Kronk receives a letter at work from his dad (John Mahoney, when we finally see him), announcing an impending visit, and this throws the hapless cook into a state of mortal fear: seems that he's been lying to his dad all along about having a beautiful house and wife, hoping to win his father's approval - the infinitely rare thumbs-up - and now that's all going to collapse. His boss (Patti Deutsch), though not terribly interested, listens on our behalf as Kronk tells the stories of the time he almost had a house, and almost fell in love: the first time, he accidentally teamed up with Yzma on a get-rich-quick scheme, but gave it all back when he realised that he'd turned his friends into drug addicts (one of them played by John Fiedler, in the last performance of his career); the second time, he had a rivalry with another scout leader, Birdwell (Tracey Ullman) that blossomed as things like that will into a romance, until he took the fall for one of his scouts and made Birdwell think that he was unreliable and craven. 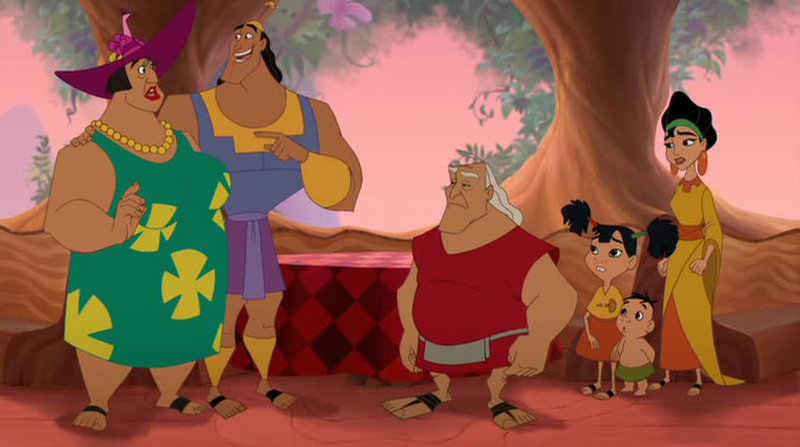 That eats up about 45 minutes, and for the rest of the movie, there's a strained farce in which solid half-dozen people show up to pretend to be Kronk's wife, all so he can temporarily avoid disappointing his dad. Kronk's New Groove manages to have the worst of both worlds: it shares the fault of the cobbled-together TV anthologies that it's disjointed, but because it is still, ultimately, a single narrative, it also fails to build momentum, since half of its plot is made up of isolated stories (and, the obvious appeal of bringing back a memorable character notwithstanding, it was a terrible idea to make Yzma the villain for about 18 minutes of the movie and then forget about her afterwards, except in one cheap joke at the end). A finer piece of wheel-spinning you could hardly hope to stumble across, though I'll claim for the movie this merit: it's trivial enough and knows it, using the same fourth-wall-breaking techniques as the original movie to eradicate any feeling of importance or seriousness, that it's at least somewhat possible that a person could enjoy it, narrative lumps and all, just because it's so light and frothy. And it is, intermittently, amusing, which has a whole lot to do with its cast and particularly Warburton, who's just a really damn fantastic voice actor, when he's called on to do it. It's also, far more than intermittently, not very amusing at all: there's an awkward amount of pop culture humor, most glaringly a reference to Gollum from The Lord of the Rings that dies as thoroughly as any joke in the history of post-modern animation. Not quite as irritating, but maybe more dispiriting, is the movie's overwhelming reliance on ancient comic situations: I know these things are for children and all, but every one of the film's distinct narratives is so profoundly indebted to the hoariest clichés from every hack sitcom you could name that even a little child, I suspect, has probably seen them. The thing looks decent, at least: I am no fan at all of the new design for Yzma, which unsubtly reminds us that she was a cat last time we saw her, but the new animators generally do an okay job of copying the old character designs, and if the thing is a little stiffer than the original (and since the visuals in The Emperor's New Groove were primarily interesting because the film combined a limited aesthetic with customary Disney lushness and depth, it really stands out when the limitations remain and the lushness does not), it's hardly shocking. By the end of 2005, we know what we're getting into, unless we are pitiably dumb. Overwhelmingly, Kronk's New Groove strikes me as being an inordinately harmless movie, with a calculated lack of bite in its storytelling, humor, or animation, and this lack is thrown into sharp relief because of how much those things make it exactly the opposite of its precursor, which it liberally quotes and copies. It's almost interesting, in fact, the tension that builds in the film between what it wants to be (vanilla kid-vid fodder) and what it acts like (the most sarcastic and weird comedy in Disney's feature canon). Almost interesting, I said. But not nearly as much as it is boring. The DisneyToon films are almost without fail bad, but it's the ones that are bad in run-of-the-mill, average ways, like this one, that evaporate from memory the most quickly.